Please see below some of our happy guest testimonials taken from our Tamborine Mountain Bed & Breakfast Guest Books. Over the years Pam & Tony have had the pleasure of welcoming and hosting many guests from all over the world. Tamborine Mountain B&B has been awarded a Certificate of Excellence from TripAdvisor for 6 years running 2011, 2012, 2013, 2014, 2015 and now 2016! 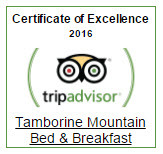 And now Tamborine Mountain B&B has just been inducted into the TripAdvisor Certificate of Excellence Hall of Fame. This unique accolade is granted only to those businesses that have won the Certificate of Excellence for five years or more in a row. The Certificate of Excellence can be earned only by receiving consistently great reviews on the world’s largest travel site. Why not consider a visit yourself to beautiful Mt Tamborine, located in the lush and serene Gold Coast Hinterland just an hour from Brisbane. Escape for a little while and come on up and visit us. You WILL be delighted and you will NOT be disappointed. Thank you so much for a fantastic stay! Beautiful place in a fantastic location. We thoroughly enjoyed our stay and loved exploring Tamborine Mountain and the wineries. Thank you for being fantastic hosts and directing us towards some lovely walks and for the lovely breakfasts. We would like to get the chance to come back someday (hopefully soon). What a fantastic place you have up here! We were made to feel so welcome from the moment we arrived and our room was absolutely perfect. The electric blankets went down a treat. Thank you so much for providing the perfect getaway from the city life. Best of luck for the future and I’m sure we”ll see you again soon. Hannah, Western Australia & James, United Kingdom. Beautiful Views, amazing people, outstanding location. Thank you so much Tony & Pam for making our weekend getaway one to remember. Dearest Pam and Tony, we really thoroughly enjoyed your hospitality! The rooms are beautiful and lovely, breakfast is yummy-licious, and the special morning trail to see the pademelons was refreshing! Thank you so much for a great time! All the best to both of you! Good health and be happy. Super friendly owners, really enjoy the serene atmosphere and ambience. We would love to be back in the near future! Such a beautiful place, so peaceful, lovely views and very good hospitality. Would come back again. The rooms were beautiful and cosy! We love the place and the great view during breakfast. Tony and Pam are so friendly, We will definitely come back on our next visit to Tamborine Mountain. Thank you so much for your hospitality. We had a wonderful time to stay for two days here. We will be back one day, see you again, Tony and Pam who are so lovely people. We have enjoyed our stay, and everything was perfect and we would love to come back soon. Had the most enjoyable time. Very comfortable, bed was great. Brekky was something to look forward to each morning. Would happily stay with you again. Thank you for a relaxing and enjoyable weekend. The place offers a lovely home away from home. Take care, thanks for having us. Thank you Pam and Tony for a lovely stay. Enjoyed the brisk mountain air, yummy food and rainforest walks. Loved your no fuss but caring attitude. Absolutely beautiful, loved our stay, for our 2oth Wedding Anniversary. Perfect Thank you. Thank you Pam and Tony for a wonderful stay, PERFECTION. Karina and Bernard, Hobart, Tasmania. Perfect spot in a nice secret location! Far from the tourists! Lovely welcoming hosts. Great break close to home. Thank you. You must be doing something right, this is our second visit and just as enjoyable as the first. What a find! We have had a really lovely stay, beautiful clean, just a delight. Thank you so much. Hope to come again. Debbie, Pete, Matt and Karmen, Brisbane. We stayed for ten days. Tony and Pam treated us with the same passion every day. They gave us an excellent breakfast every day. Thanks very much. Geoff and Annabelle, Port Headland. Beautiful place and we had a wonderful stay. Thank you so much. A wonderful stay in paradise. Thoroughly recommended. Thanks so much for your hospitality and service. What a wonderful place to stay. Amazing views, breakfast and service. Came for the beauty, welcomed the scenery, fell in love with the cockatoos at breakfast and the lorikeets in the tree. Thank you for a great stay. Thank you for a wonderful stay! I felt right at home and relaxed. The bed was divine. What a delightful stay? You have a beautiful place, wonderful hospitality and SUPER breakfast! New friends in Australia. What a great weekend! Celebrating a 60th birthday. Relaxing and thoroughly enjoyable! Hope to return sometime soon. Thank you for a great and cosy place to stay. It’s very refreshing having a holiday where you’re welcomed into a home away from home. You have a beautiful/very beautiful view. Will be back again. Lovely place, lovely views, lovely food and a lovely couple. Was a great experience. Very peaceful and enjoyable. The hospitality was magnificent. Thank you for such a warm and friendly welcome. Our stay has been comfortable and relaxing. We may return again and will happily recommend to friends. The loveliest people, beautiful cabins and extremely comfortable beds. We will definitely be back to spend more time. As usual we’ve had a lovely stay on the Mountain. We would recommend your place to all our friends. Thank you for a most welcoming and comfortable stay and of course “that view”. 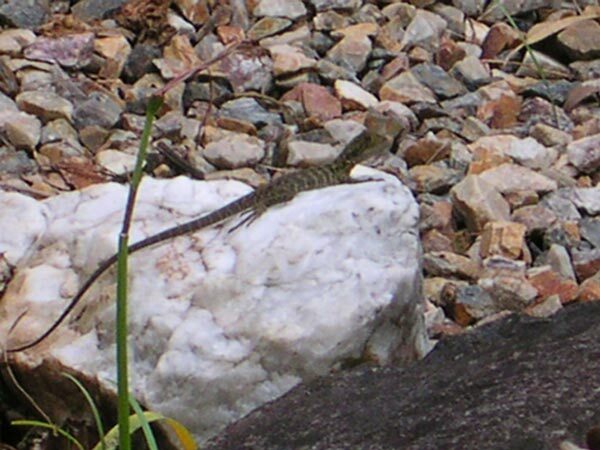 Relaxed, unwound , exhilarating views, fantastic Aussie home, natural wood very earthy, beautiful wildlife. Thank you. Look forward to returning. Tony and Pam, you have a piece of paradise! Great Views, great service and a great time was had. A very pleasant stop at Tamborine Mountain. Much appreciated accommodation and kind hosts. Very comfortable and lovely breakfast with fantastic views. Thank you. 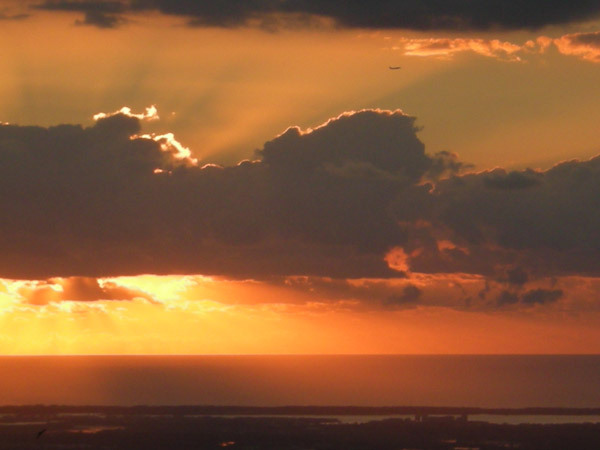 Heavenly break, really clean, beautiful birds, hospitable and friendly hosts. Thank you for a lovely stay, great hosts beautiful, views, great shopping. You have a wonderful place, view, peace and quite (except for the wildlife which is acceptable). We really enjoyed our stay. Thank you for the experience. Thank you Pam and Tony for your amazing hospitality and for the blessing of staying in your fantastic accommodation. We loved our stay and would definitely come back. Kindest regards. What an amazing time we have enjoyed with our hosts. Thank you so much for your hospitality. We have enjoyed our time here on the roof of the beautiful Gold Coast and all the beauty of the Tamborine Mountain area. Thanks. Wonderful spot with gracious hosts. A very friendly comfortable base from which to explore “the Mountain” Thanks. Dear Pam, Tony and Elle (of Course), enjoyed our “too brief “ stay. Great company. Great breakfast and great place. Certainly a wonderful place. Thanks for a lovely relaxing weekend. Great location and wonderful company. Thank you for helping us share our 2nd wedding anniversary. We feel very spoilt. Take care, see you both soon. To our wonderful hosts, Pam and Tony. Thank you for your most welcoming hospitality. We felt like we were in a home away from home. Its been wonderful sharing the Scarecrow Festival with you and the wonderful locals we met during our stay We will see you both again. Thank you so much! We enjoyed our stay tremendously! Lovely place, even lovelier couple! See you again soon. Enjoyed our stay, very comfortable and relaxing. Beautiful setting, beautiful room, yummy breakfast!! Will be back. It was a beautiful stay, fantastic views! The room was lovely & breakfast was fantastic Thank you very much! Thanks Pam and Tony for a great three days. Beautiful views, rooms, hospitality and great food. Highly recommend this as a lovely B&B. Wonderful B&B, amazing views and thanks for all the lovely little extra touches in the room. This is a beautiful place, you have done an amazing job and created the perfect scenery for the perfect stay. Breakfast was incredible. Congratulations for your home, and once again thank you for everything. Beautiful Stay and the best bed I’ve ever slept in! Love your wonderful property & will most definitely be back if we are up this way. Beautiful place with amazing views. Breakfast was lovely, looking forward to coming back. Thank you very much for an amazing stay. The accommodation, food and ambience were all PERFECT. Thank you again. A wonderful spot for a getaway, great company, beautiful views and scrumptious food. Many Thanks. We have had a great weekend here. The room and your company, plus that of the other guests was terrific. Using your B&B as a base was something of a novelty to use to visit this wonderful part of Queensland. Thanks again for being “Top Hosts”. I will talk about your breakfasts for a long time. Thank you both for sharing your wonderful view and knowledge of paradise. Thank you Pam & Tony for welcoming us to your beautiful home. We will return when we can and had a most enjoyable and relaxing time. John and Teresa, Monterey Keys Gold Coast. Thank you for a wonderful tranquil stay, accommodation and atmosphere brilliant . Will come again and also recommend. Thank you again. Thank you for providing such a lovely place! It’s sooo amazing to stay in such a beautiful country house. So proud of you to have kept the place stunning yet comfortable. Hope to stay with you again. Great views and peaceful surrounds. A lovely spot to relax. Thank you Pam and Tony for your wonderful hospitality. The peace and tranquility was just what the Doctor ordered (And you have the best coffee). Barbara and Colin, N. Devon, England. What a wonderful spot you have here, a memorable two days, and not because of the weather! Your hospitality has been exceptional. Thank you for your making us so welcome and comfortable. Thank you for this beautiful stay in this beautiful location. This place is really nice and cosy. Friendly and welcoming hosts. Thanks and might see soon. Came away for a relaxing weekend away from the hussel and bussel of city life. Never been more relaxed. Thank you for your warm and inviting B&B. Absolutely awesome, sooo peaceful and wonderful views! Great hosts, we will be back again and again. Thank you Pam and Tony for your hospitality. Warm cosy accommodation, wonderful breakfast. Nothing was to much trouble. Will tell all our friends. Thank you Pam and Tony for welcoming us to your beautiful home. We will return when we can and had a most enjoyable and relaxing time. Very relaxing environment, great to get away and kick back. We had a wonderful time. We have had a fantastic stay, you have a beautiful place. Thank you so much for your wonderful hospitality. You have the best house on the mountain, a delightful combination of views, trees, and wonderful hospitality. Thank you and we’ll be back. What a lovely place! Thank you so much for a great nights stay! You will definitely see us again. Thanks so much for your warm hospitality and such a relaxing start to our day,Terrific breakfast. Thank you so much for a lovely weekend Tony and Pam, wonderful hosts. Fantastic breakfast, lovely room, magnificent views. We would highly recommend. Thank you for the lovely stay, delicious food, spectacular view and hospitality. All the best. Thank you for your generous hospitality. We have so enjoyed our stay& will be back. Thanks Pam and Tony for a wonderful stay. It has been a pleasure meeting you both and so relaxing. We shall definitely return. Great food, great place. Thanks again. Terry and Robyn, Sunshine Coast. Dear Pam and Tony, Thank you so much for a wonderful place here and thanks for the generous hospitality. Many thanks for a good holiday, we really enjoyed breakfast on the deck. Thank you for a lovely night and a yummy brekky, we will be back hopefully with a group. We felt right at home. Thanks. Thank you very much for making our late decision stay a beautiful one. We could sit on your beautiful deck for hours! Thank you very much for a wonderful stay, it was well worth it, especially with the beautiful view. Thank you! Cathy and Phillip, Gold Coast. Thank you for a wonderful, relaxing stay. We shall be back. Thank you so much for providing a delightful, relaxing ‘home away from home’. The views are fantastic, the food delicious. We shall be back! The room is really pretty and I love the view!! It’s been a great experience staying here. I wish you both good health and happiness for the years to come. Cheers! What a lovely place! Peaceful, quiet and a delicious breakfast. Love Elle the dog too. Thanks so much. Tony and Pam, Thank you for allowing us to stay with you. You are amazing, friendly and helpful. We can’t wait to come back! Had a nice time. Enjoyed it very much. We will be back. Tony and Pam, really enjoyed your wonderful home, view, and excellent breakfast. Your hospitality was greatly appreciated. Warm and beautiful home , complimented by the two of you. All the best, We’ll come back again. Thank you so much for a very comfortable, relaxing and friendly stay and for the the Davidson plum jam! Yum! Pam and Tony, thanks very much for a fantastic few days. We loved the atmosphere and your hospitality. We will definitely be back some time. Thanks also Tony for going that extra mile for us. Thank you Pam and Tony for a relaxing and comfortable visit once again. As usual the food was delicious. I had a great time and the breakfasts were delicious and the room was very comfortable. Loved our room, loved the view from the deck. Enjoyed our exploring of Tamborine Mountain. Everything was great. We had a gift voucher from our son and daughter-in-law and family, and we are so grateful. Thank you for your hospitality. We thoroughly enjoyed our third visit, beautiful place and beautiful people. Thank you Pam and Tony for a lovely stay – I’ll certainly recommend your B&B to my friends and family. Great view, wonderful room, warm hospitality, who could ask for more? Thank you Pam and Tony, for being wonderful hosts and the view is stupendous!! What a great place, in the trees, filled with wildlife. Amazing views and friendly hospitality. Such a great experience we didn’t want to leave. Tamborine Mountain is a magical place. Thoroughly enjoyed our stay. Awesome views, brief as it was. Breakfast was great, we’ll be back. Thank you for such a wonderful breakfast and stay. We are sure to recommend this b&b to our friends and family. Beautiful views and hospitality. Rooms nicely decorated and very comfortable, would love to come back. Thanks for your hospitality and the opportunity to really relax. We have had a great weekend, courtesy of the wonderful accommodation and your friendliness. We had a great time staying at your b&b. Hope to come back for Christmas in July. The rooms are really great and the garden is an absolute credit to you both. Thank you for your wonderful hospitality. It was wonderful to stay in your beautiful b&b, thanks. Fun in the showers! Views and clouds. Just a great spot and thanks Tony & Pam for your interest and kindness. Thank you for your hospitality and wonderful breakfast. it was lovely to stay in such a great b&b. Thank you. This was lovely, so relaxing. Thank you for your great hospitality. Lovely environment and great place to stay. Thank you. Thanks for a lovely stay. an absolutely fantastic place, great breakfast. We had a lovely time at your b&b. the weather was grim, the welcome and hospitality was warm. Thank you for a wonderful stay. Great views, a great breakfast and superb hosts. Very impressive, not just for the views but for the whole package! This was our last B&B before visiting Family and we can say it was the best of the whole trip. Warm and comfortable hosts and lots of wildlife info also. Thank you! Beautiful spot and very welcoming Thanks! What a wonderful setting! Room was lovely, clean and comfy. Atmosphere is absolutely gorgeous. Thank you for a nice stay, we’ll be back. Great breakfast, comfy beds,very friendly, very happy with the experience. Wonderful experience, spectacular views, just a wonderful relaxing stay. Thank’s so much. Cosy atmosphere, very comfortable, delicious brekkie!! Thank you. Everything was just beautiful, the room was gorgeous and cosy, and breakfast was delicious and fresh. Thank you for having us, we hope to come again. What a lovely setting! Room was lovely, clean and comfy. Atmosphere is absolutely gorgeous. Thank you for a nice stay, we’ll be back. Thank you Pam & Tony for your hospitality. We loved the room, the fire and breakfast. Will recommend and be back. Pam & Tony, Thank you for making our overnight stay a relaxing experience. Wonderful views and great to be so close to nature. A lovely location with stunning views and best nights sleep ever. It was a thrill to walk to the rainforest and see the Pademelons. Thank you Pam & Tony for an enjoyable 2 night stay. Wish we could stay longer and hope to return. Very enjoyable, very cosy, felt most welcome. Liked the room and the personal touch. We could make the trip again sometime. Absolutely beautiful place! Thank you for your hospitality. Love the strawberry and rhubarb jam. Thank you for a great stay, great people, great food. Thank you! Thank you for a lovely stay. Breakfast was delicious. We will make sure we always stay here when we visit Tamborine Mountain. Thank you both for an excellent place on our special 25th Anniversary. Breakfast was awesome. You both are beautiful people and we will recommend this place highly. Dear Pam and Tony, Superb! Had a ball, thanks for the lift and all the tips. Dear Pam, Tony and Elle, thanks for your hospitality, I’ve really enjoyed my stay (this is my third visit!) Your B&B is a home away from home! See you again next time I’m in Queensland. Thank you for such a restful time in your lovely B&B. The setting is amazing, enjoyed the yummy breakfast and entertaining birds. We had a great day and appreciated your gracious hospitality. What can I say. Very peaceful, warm, great hospitality, will definitely be back. 10/10 guys! Thank you for being such wonderful hosts. The room and the rest of your Guesthouse has so much style… just lovely, and of course the view of the Gold Coast and the great breakfast. Wonderful mountain retreat, enjoyed your hospitality and lovely accommodation. Exceeded all expectations. Hope to return. Wonderful experience, nice to be lazy and just enjoy the atmosphere and wildlife. Guys, we have just enjoyed every minute of our stay. Thank you so much for your hospitality. I absolutely loved that bed in room one. We’ll see you again! What an amazing jewel on the mountain. Stunning views and superb hospitality. 4 nights and it wasn’t enough. We’re coming back for more. Had a lovely stay here and would return to stay again. The hosts were just great and very friendly. Comfortable bed, delicious breakfast. It was lovely to wake up with the birds. What a wonderful setting for a quiet getaway. We enjoyed our one night stay with what was a delightful breakfast complimented with fantastic views from the balcony amongst the friendly bird life. We will recommend you to all. Well done. Thank you. Thanks for a very relaxing stay, rooms were great. Food was even better, Awesome views. Thank you for the wonderful stay, you have a beautiful home and the views are amazing, as are the Hosts!! We shall definitely be back. Amen, praise the Lord for his creation. Thank you for sharing your home and your heads with us over a lovely breakfast . May you always appreciate what you have received. What a wonderful piece of paradise. Peaceful, tranquil and with beautiful birds. Thank you for being so very friendly and welcoming but providing space. Fantastic views, great healthy breakfast & a homely room that made us feel welcome. We look forward to the next visit. A truly amazing place! Views are incredible and the hospitality really warm. Thank you, we will remember our stay with affection. We had a lovely relaxing time. The views were amazing and ever changing. I particularly liked the friendly atmosphere and talking to the other guests. I loved the Breakfast!!! What a fabulous birthday present for today. Pam & Tony, you have been more than gracious and made our stay with you memorable! We felt we were at home and we have every plan to return. It was lovely to return to this beautiful spot on the Mountain. Thank you again. Thank you for a beautiful room and wonderful hospitality. The breakfast was delicious and the surroundings were tranquil and luscious. We would definitely come back again. Wonderful hosts, fabulous food, great accommodation, what more could anyone ask for – oh, of course the great views! A wonderful weekend, accommodation to dream of, a devine breakfast, wonderful hosts, perfect views. Would I come back,yes, Would I recommend this place to others, definitely! This is truly a wonderful, friendly & memorable B&B, with fantastic food and most importantly lovely people. Thanks for making our stay a great one. Just lovely, thoroughly enjoyed the total ambience of the place. Great brekkies, cosy accommodation & views to die for. What a great experience, the birds, the view, the silence, the food, the conversations, all filled the soul. Lovely place, lovely people, Elle, the beautiful dog, great food, million dollar views. Thank you so much for making our stay here both enjoyable & comfortable. Tony & Pam, you have been brilliant hosts; providing wonderful services and so friendly. The rooms are very clean & comfortable. We thoroughly enjoyed the beautiful view. God willing, if we come here again we will definitely come back here and we will recommend TMB&B to our friends. Please do come and visit us if you drop into Singapore. God bless you richly. This is our second time back in this HAVEN. What a wonderful circuit breaker to the craziness of city life and small business. Pam and Tony, your hospitality is unparallelled! Thank you for looking after us ! What a glorious spot! So glad we found you. Thank you for your wonderful hospitality. Had a great 14th Wedding Anniversary here hosted by you. A very special place. We hope to see you again soon.